On August 11, 2007, across the U.S. and in nine other countries, the lights were switched off and the whirring and clicking of film through sprockets, accompanied by the brightly projected image on a small silver screen, began. This was Home Movie Day, an annual celebration of the amateur film recordings of daily events — some significant, most obscure, but all important. Dwight Swanson, a film archivist and one of the five founding members of the not-for-profit Center for Home Movies, and his colleagues felt that spreading awareness of home movie preservation was an important outreach. It was also a tremendous challenge for a handful of enthusiasts. “Instead of waiting for the public to find us and bring their collections forward, we created Home Movie Day as a means of public outreach to advance the awareness and appreciation of these films. Although motion picture film cameras appeared as early as the 1890s, not until 1923 and the development of the 16mm format did an appreciable number of amateur cameras appear. By 1932, the smaller 8mm camera and film hit the market and, for the next five decades until the advent of video, was the standard format for amateur filmmakers to document everyday life. But their documentation did not stop. Swanson says that the term home movie covers a huge variety of subjects and locations, but his and others’ experience with Home Movie Day quickly dispels the notion that the words home movie and tiresome are synonymous. The unique quality of the home movie, Swanson explains, is that throughout a film collection, the filmmaker is usually the same person in the family. And with the exception of a vacation, the film images are nearly always shot at home or in the community. While an amateur film of a backyard picnic sounds like fairly uneventful footage, Swanson and his colleagues in film preservation point out that exactly this type of documentation is very revealing. This untapped repository of cultural history drives the Center for Home Movies and has contributed to the success of Home Movie Day. There is also a huge amount of personal investment in creating home movies. Swanson cites a film in which a father documented the life of his son who had Down syndrome from birth to age 15. The challenges that both father and son experienced are seen in these images as he recorded his child having to eventually leave home and live away from the family to attend a special school. Preserving the vast number of film images is the lifeblood of the Moving Image Collections initiative, described as “A Window to the World’s Moving Images.” Designed for archivists, researchers, science educators and the general public, MIC is sponsored by the Library of Congress and the Association of Moving Image Archivists. Jane Johnson Otto, the MIC project manager, says the MIC effort grew out of the film preservation initiatives from the 1990s when testimony before Congress identified a film preservation crisis and the need for immediate action. Working with others in the field, the Library of Congress and the AMIA identified the first and most crucial step in any preservation solution as a standardized way to identify holdings, she says, particularly unique titles. The idea, Otto says, was to develop a global database that would allow organizations to enter and catalog their materials using standard formats or their own formats mapped to a standard. The goal was to allow students, documentary filmmakers and everyone else unprecedented access to moving images. Otto says the architecture of MIC was the brainchild of Grace Agnew, who, with the funding of a National Science Foundation grant, arranged technical assistance with Georgia Tech, the University of Washington and Rutgers University. There are currently 15 archives in the MIC consortial database, including over a half-million records, and about 250 organizations in the MIC Archive Directory. Since its launch, MIC has been visited more than 8.4 million times by nearly 400,000 unique users (currently over 5,000 hits per day) hailing from more than 50 countries. Swanson says the global interest in film preservation is also reflected in the international participation of Home Movie Day. Nine other countries held an event in 2007, and he believes this number will grow. The Center for Home Movies acts as the umbrella organization and provides a set of guidelines for potential Home Movie Day organizers to follow. He says more than 40 U.S. cities participated last year, and the movement is gathering steam, largely by word of mouth of participants and the enthusiasm of other film archivists. But Home Movie Day is just the first of several projects in the planning stages, Swanson says, looking to the future of Center for Home Movies-sponsored academic conferences, preservation activities and more. This year’s HMD will be October 18, and for people having no locally planned event, Swanson says it’s not too early to start thinking about hosting one. 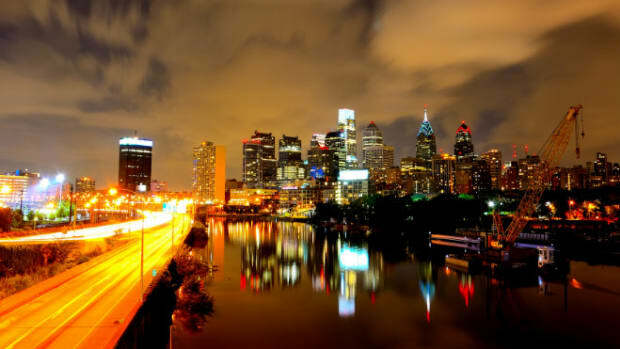 Will Philadelphia Ever Be Home to a Middle Class? Jake Blumgart has watched his friends decamp his adopted hometown for places with more opportunities and city services. Will anyone be left to build a better Philly?